Namco Networks has just announced that it has submitted Pac-Man Remix, a modern take on its 1980 arcade classic, to the App Store. Based on the world-famous arcade hit, PAC-MAN REMIX showcases enhanced graphics and lots of new exclusive features like boss battles, stage-specific gadgets, and power-up items! Guide PAC-MAN through the maze and avoid the brightly colored ghosts while chomping up all the dots. Eat a power pellet to temporarily turn the tables on the ghosts. Gobble up as many ghosts as possible while they are blue. Chomp the ghosts consecutively during one power pellet to score major bonus points! 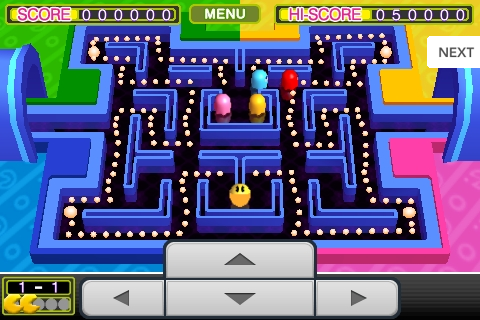 Two methods of control are offered in the game: on-screen directional buttons and swipe controls, like those used in Namco’s iPhone version of classic Pac-Man. 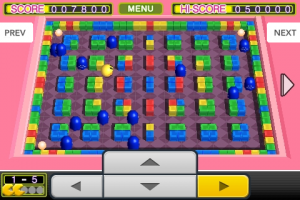 The game appears to be an evolved / extended adaptation of the studio’s well-reviewed 1996 release, Pac-Man Arrangement, which is an excellent remake I’ve spent considerable time with on the Gameboy Advance. If Remix is anywhere near as good as Arrangement — which it should certainly be — then iPhone gamers are in for quite a treat. Pac-Man Remix has been submitted to the App Store and should appear later this week at a price of $5.99. Namco also took this opportunity to announce the launch of a new division within the company, dedicated exclusively to the iPhone and iPod touch. The new ‘Apple Games’ division is headed up by former I-Play Mobile Gaming producer and designer Jonathan Kromrey. And while the announcement of Pac-Man Remix brings a smile to my face, the creation of the new division within Namco focused entirely on iPhone gaming, and the studio’s commitment to the platform that such a move reveals, is a much more significant turn of events. We can’t wait to see what the studio has in store.